When you take a voice that is a graveled mix of Walter Trout and Curtis Salgado and back it with a strong blues band featuring Debbie Davies on guitar, you have a shot at a great album. When you ace it with a tasteful selection of classic tunes and your own compositions, you have album of the year material. 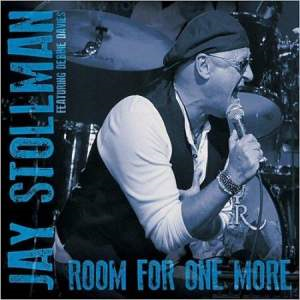 Jay Stollman, who hails from the northeastern part of the United States, is my selection for debut Blues Album of 2015 with his first CD, Room for One More. Lonesome in My Bedroom is a classic grindin’ blues tune by Luther Johnson that showcases Jay’s voice and Debbie’s guitar tone…..sweet stuff. His cover of the Sam Cooke’s A Change is Gonna Come is spine tingling and merits consideration for soul blues tune of the year. The original composition, Devil In Disguise, is great rockin’ blues featuring some badass harpin’ by Kevin Totoian. And Jay’s foray into Little Feat musical territory with his original Love Me Or Leave Me is a tasty little number with some nice slide guitar work by Andy Abel. Ride Till I’m Satisfied is a great blues shuffle with nice guitar licks and the tasteful use of the organ that was originally recorded by Walter Trout. Overall, this was a thoroughly enjoyable listen! Buy this album! It is great contemporary blues from the first note to the last. I can’t wait to see him live sometime soon when he ventures back to Connecticut. Have a listen to A Change is Gonna Come …. The year of 2015 witnessed the passing of the most recognizable and influential of all the blues artists in my life, B. B. King. Born Reginald King in 1925, he burst onto the music scene in 1949 and spent his career introducing the blues and up and coming blues artists to audiences around the world. Considered one of the top 10 blues guitarists of all time, he and his beloved guitar “Lucille” toured relentlessly for 66 years performing over 15,000 live shows and recording over 40 studio albums. His most famous recording, The Thrill is Gone, is considered a blues classic. But I have chosen a song for you that Buddy Guy and he performed that moves me every time I hear it….Stay Around a Little Longer. The world will miss the gruff and gravely voice as well as the guitar and piano playing of Wendell Holmes (71). He was part of the Holmes Brothers trio featuring Wendell, his brother Sherman on bass, and “Popsy” Dixon (72) on drums. Popsy met the brothers in 1967 and they eventually formed the Holmes Brothers in 1979. Featuring a mix of soul, the blues, and gospel style R&B, the Holmes Brothers released their first album in 1990 and went on to record 12 studio albums. Here is a song that is a regular part of my playlist, Run Myself Out of Town. One of the defining songs of my generation, When A Man Loves A Woman, was recorded by Percy Sledge (74) in 1966. Though it was to be his only #1 hit, he went on to enjoy a fabulous career winning the 1996 Soul Blues Award for his album BLUE NIGHT. In 2005, he was inducted into the Rock & Roll Hall of Fame. Even after all these years, this song still moves me like it did on the gym floor of junior high school dances way back in the day. A soul and R&B singer best remembered for songs with the Drifters 1958-1960 (There Goes My Baby, Save the Last Dance For Me, This Magic Moment) and solo performances of Spanish Harlem (1960) and Stand By Me (1961). Born Benjamin Earl Nelson in 1938, he changed his name to Ben E. King when he launched his solo career in late 196o. He had five #1 hits in his career and enjoyed a resurgence in 1986 with the release of the movie “Stand By Me” that featured his song which rose to #1 in the UK and #9 in the United States. Here is a recording of his first solo hit, Spanish Harlem.